Preheat oven to 200ºC (or 180ºC fan forced). Line a large baking tray with baking paper. Rub lamb all over with dried herbs and half the garlic. Heat 1 tablespoon of the oil in a large, non-stick frying pan over medium-high heat. Cook lamb, turning, for 5-6 minutes or until browned all over. Transfer to prepared tray. Season. Bake for 25-30 minutes for medium or until cooked to your liking. Stand, covered loosely with foil, for 5 minutes before slicing. Meanwhile, to make the hommus: place chickpeas, rind and half the lemon juice, half the chilli, remaining garlic and 2 tablespoons oil in a food processor. Add a quarter cup cold water and process to combine. Season. For the cucumber salad: combine cucumbers, onion, tomatoes, mint, remaining juice and oil in a bowl. Season. Toss gently to combine. Transfer to a serving platter. Scatter with feta, remaining chilli and extra mint leaves. 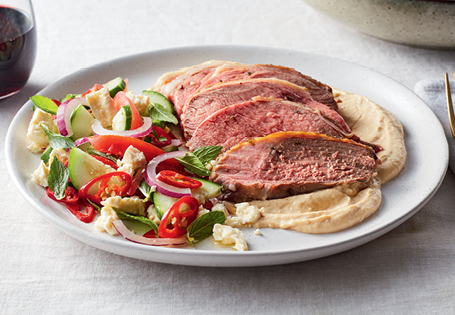 Serve lamb with lemon chilli hommus and cucumber salad. Note: Roasted butterflied leg of lamb is an easy main dish. Flavoured here with Italian herbs and garlic, its simply delicious. Lamb loves spice, herbs and garlic, all great to enhance the lamb’s natural flavour. This recipe matches it with a colourful cucumber salad and lemon chilli hommus.